Treat your family to the ultimate seaside getaway at Horizon Gold Coast Family Resort. Situated on the Gold Coast Highway in Burleigh Heads, only 50 metres from the award winning Burleigh Beach, Horizon Holiday Apartments is the ideal base for your next beach based holiday with family or friends. 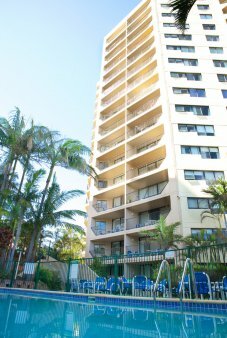 Our 15 storey, comfortable and affordable Burleigh Beach accommodation features a selection of spacious, fully self contained one and two bedroom apartments, ideal for couples, individuals and families of up to six members. With a full range of guest facilities, including a heated outdoor pool and spa, kids wading pool, sauna, games room and children’s playground, the Gold Coast family resort has something to keep all ages entertained. To ensure you make the most of the fantastic local climate and breathtaking views, each apartment features a private balcony – perfect for relaxed family breakfasts in the open air! As well as being just a short stroll from the golden sands of the beach, our holiday apartments Burleigh are just seven minutes from the Currumbin Wildlife Sanctuary and less than half an hour from many of the Gold Coast most loved visitor attractions, including the renowned Jupiter’s Casino, Pacific Fair Shopping Centre, Sea World, Dream World and Warner Brothers Movie World. Food lovers are well catered for with a great selection of cafes and restaurants nearby and renowned dining destination Broadbeach only ten minutes away by car. The Gold Coast’s entertainment capital, Surfers Paradise, can also be reached in just 15 minutes, so there’s nothing stopping you exploring all the shops, restaurants, art galleries and visitor attractions that make the city so popular with people of all ages worldwide. Book your stay at Horizon Gold Coast Family Resort now and start planning your family’s next holiday today!